Cirkelbroen celebrates pedestrians. It reflects the daily life and intimacy that you find around the canal in the Christianshavn neighbourhood, its houseboats and sailing boats, the unique life on the ramparts. Copenhagen’s harbour was once a centre of maritime activity, and Cirkelbroen is a testimony to that history. While working on the bridge, I remembered the fishing boats I saw as a child in Iceland. In the harbour, the boats were often moored right next to each other, and it sometimes seemed that you could even cross the harbour just by walking from boat to boat. 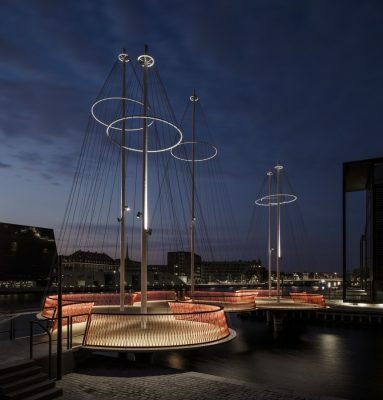 The bridge is made of five circular platforms, and it contributes to a larger circle that will form a pedestrian route around Copenhagen Harbour, where people – cycling, running, walking – can see the city from a very different perspective. As many as 5,000 people will cross this bridge each day. 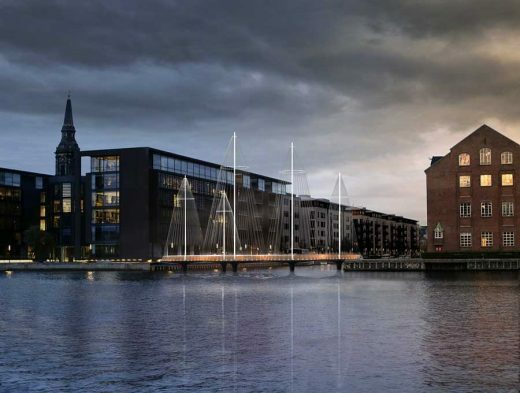 I hope that these people will use Cirkelbroen as a meeting place, and that the zigzag design of the bridge will make them reduce their speed and take a break. To hesitate on our way is to engage in bodily thought. I see such introspection as an essential part of a vibrant city. In Copenhagen, progress has been made in thinking about what constitutes quality in urban space and about the atmosphere of a space. Obviously, one cannot plan atmosphere, as it is co-produced by the people who use the space, but it is possible to nurture an atmosphere, to allow it to grow. As an artist, I work with abstract and emotional qualities, so this is where, I believe, art can play a role. I’m convinced that politicians, urban planners, and developers need to expand their toolbox by bringing in what I would call creative reality producers – artists, social scientists, sociologists, anthropologists, historians, dancers, poets, environmental activists, and philosophers – to rethink urban spaces. In Denmark, there is a strong tradition of focusing on inclusion, on accepting the other – welcoming ideas that we have not yet had, people we have not yet met, and unpredictable encounters. It’s something we all have to work on together, and one way of addressing this is in how we plan public space. Cirkelbroen, I hope, will contribute to improving the quality of life and the development of a hospitable and inclusive city. 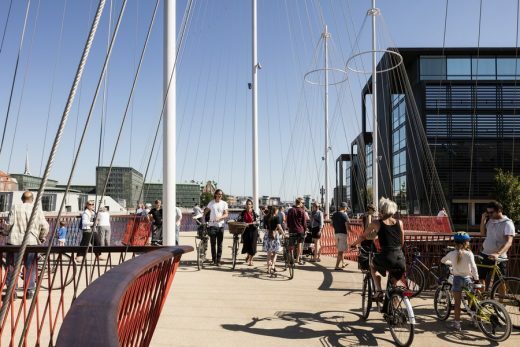 Cirkelbroen (2015) was built by Nordea-fonden as a gift to the city of Copenhagen. Nordea-fonden is a non-profit and charitable foundation supporting activities that promote good living in Denmark. 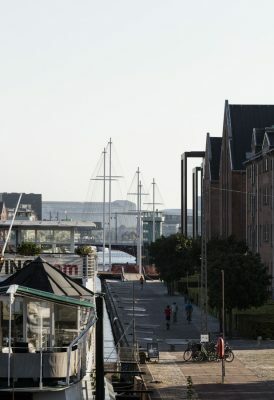 Based on the Christianshavn district’s maritime history and culture, Olafur Eliasson used the sailing boat as the visual point of departure for the design of Cirkelbroen. The bridge consists of five staggered circular platforms of various sizes, each with its own ‘mast’. Cirkelbroen is lit at night, and one section of the bridge functions like a swing bridge, rotating to allow large boats to pass into and out of the canal. Studio Olafur Eliasson: Sebastian Behmann (architectural design), Robert Banović (project architect) and Jan Bünnig (prototyping). 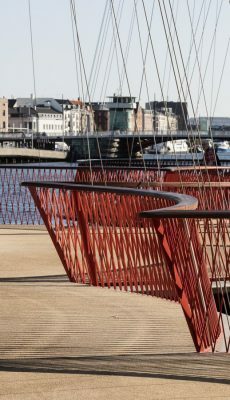 Builder: Nordea-fonden has built the bridge as a gift to the City of Copenhagen, which, now is responsible for its operation and maintenance. Nordea-fonden supports non-profit and charitable purposes. the City Council of Copenhagen on 22 January 2015, and implemented by means of an executive order of 2 February 2015. The building project commenced on 15 March 2012. It was completed in August 2015. Canal to connect the Christiansbro area with Applebys Plads. 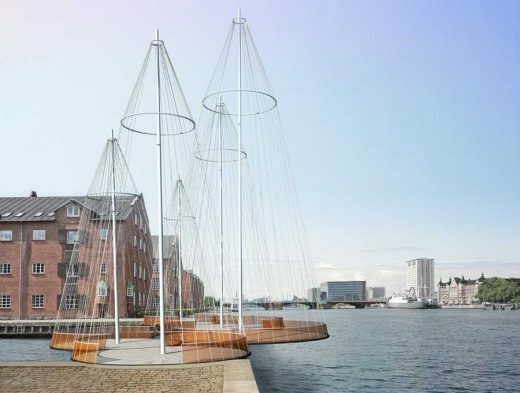 For years, it has been a goal of the City of Copenhagen to create a contiguous boardwalk along the inner waterfront. Time-lapse – Bridge under way and done- Cirkelbroen, Copenhagen. Size and opening: The bridge is roughly 40 metres long with a water-clearance height of 2.25 metres when closed. The total length of the rotating part is around 25 metres long. The bridge opens as a swivel bridge to provide an open navigable channel of 9 metres. 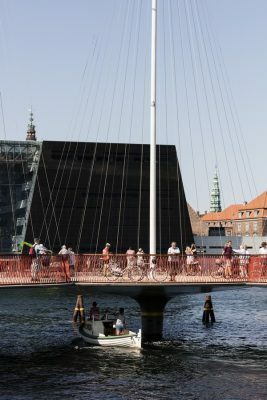 The bridge is a part of the City of Copenhagen’s bridge-opening policy. After receiving security certification, the local bridge society will be able to open the bridge with a key card. It takes about 20 seconds to open the bridge. The name: The name “Cirkelbroen” (the Circle Bridge) arises from its shape: five differently-sized circular platforms, each with its own ‘mast’. The circle presents an alternative to the direct line across the water. 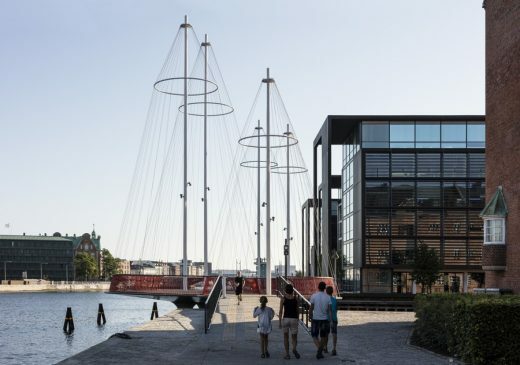 It encourages pedestrians and cyclists to reduce their speed; it provides a vantage point where people can take a short break, thus creating a new space between two urban areas rather than providing the fastest possible route across Christianshavn Canal. The circle also refers to the compass, to orientation and to cartography. It suggests a dynamic navigation model which enables a renegotiation of the public space. In so doing, the bridge makes small changes to the way we perceive and experience the city. At a macro level, the circle refers to the circle drawn by the inner city of Copenhagen, which Cirkelbroen helps to complete by connecting the Christiansbro area to Appelbys Plads. together with the street lighting. The opening of the bridge is operated by local sailors (Brolauget Cirkelbroen) by activating the controls in a control box on the north ramp using an electronic card, which identifies the user. It takes about 20 seconds to open the bridge. Weight: the bridge, guardrails, elevated pedestrian bridge, masts and bearings together weigh 210 tonnes. The biggest single section weighs 132 tonnes. Cables: A total of 118 were used. 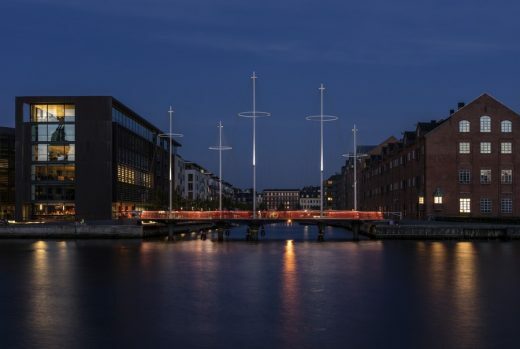 The internationally acclaimed Danish-Icelandic artist, Olafur Eliasson, has designed a new bridge, Cirkelbroen (the circle bridge) which will create a winding path across Christianshavns Kanal in Copenhagen connecting Christiansbro with Applebys Plads. 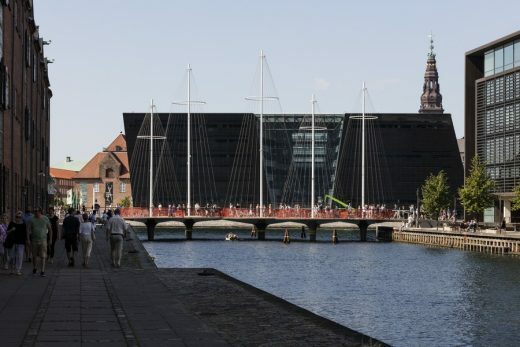 From 2012, when the bridge is expected to be completed, the city’s residents and visitors will be able to run, walk or cycle around Copenhagen’s entire inner harbour for the first time. Olafur Eliasson said: “It is my hope that people will stay on the bridge, use the bridge as a public square. In contrast to the long, straight pier, the winding bridge will reduce speed, turn focus. Rather than offering the fastest possible passage across the canal, the bridge will create small variations in the way we see the city and open for a renegotiation of public space”. 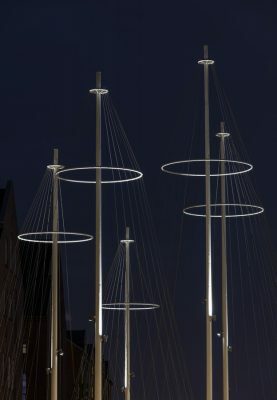 Based on Christianshavn’s history and the culture around the canals, Eliasson has used the sailing ship as his visual starting point for the bridge. 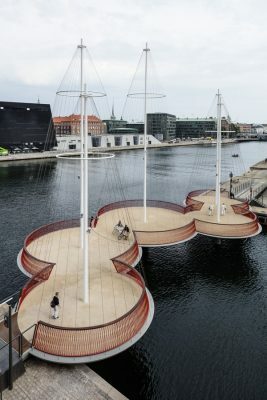 Cirkelbroen consists of five staggered circular platforms of various sizes each with their own ‘mast’. 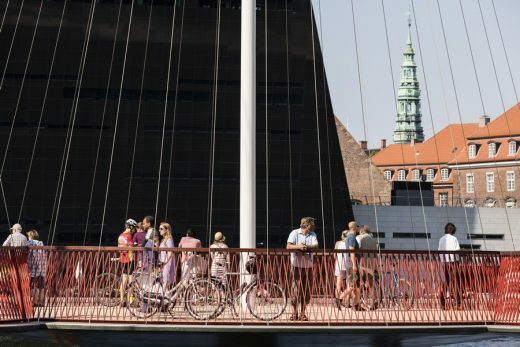 The bridge is a gift to the Municipality of Copenhagen from the Nordea-foundation, which is situated in Overgaden neden Vandet right on the canal of Christianshavn. The purpose of the Nordea-foundation is to support activities that promote good living within the areas of health, sports and exercise, nature and culture. 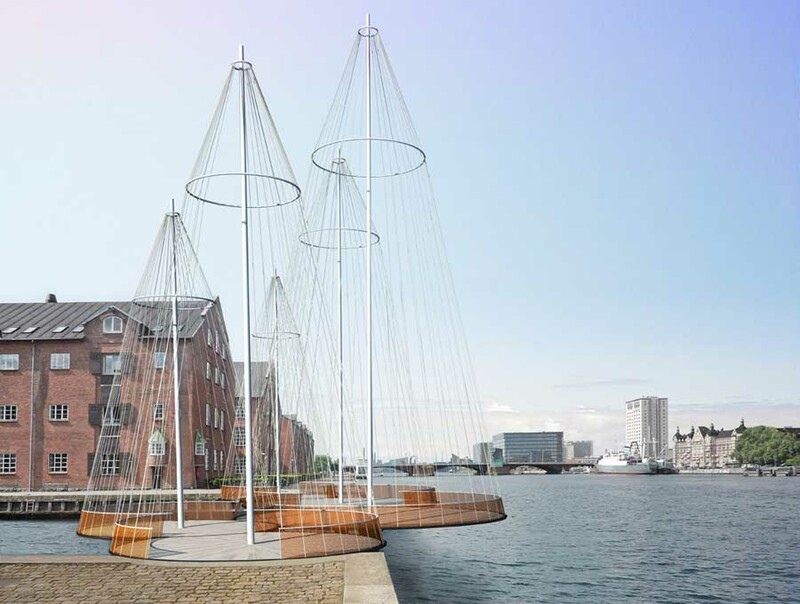 Olafur Eliasson’s bridge will provide new possibilities of outdoor life and cultural activities around the port that throughout history has made Copenhagen a very special city. Cirkelbroen was designed by the Danish-Icelandic artist Olafur Eliasson. Across Christianshavns Kanal. The bridge links Christiansbro with Applebys Plads. The bridge will be around 32 meters long. The free height under the bridge allows harbour tours and small motor vessels to pass under it. For taller vessels, the bridge will open in a horizontal arc. The bridge will cost around DKK 34 million. 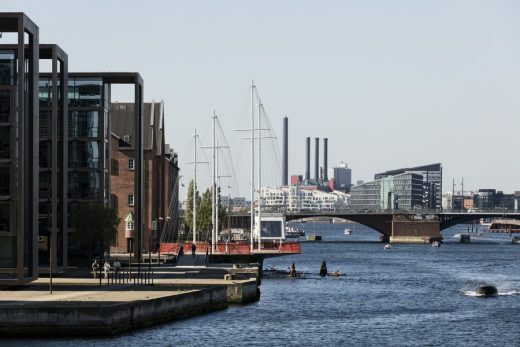 The Municipality of Copenhagen contributes DKK 7.7 million, which stems from a deed of gift it received from Privatbankens Fond (now part of the Nordea-foundation) at the city’s 800th anniversary in 1967. 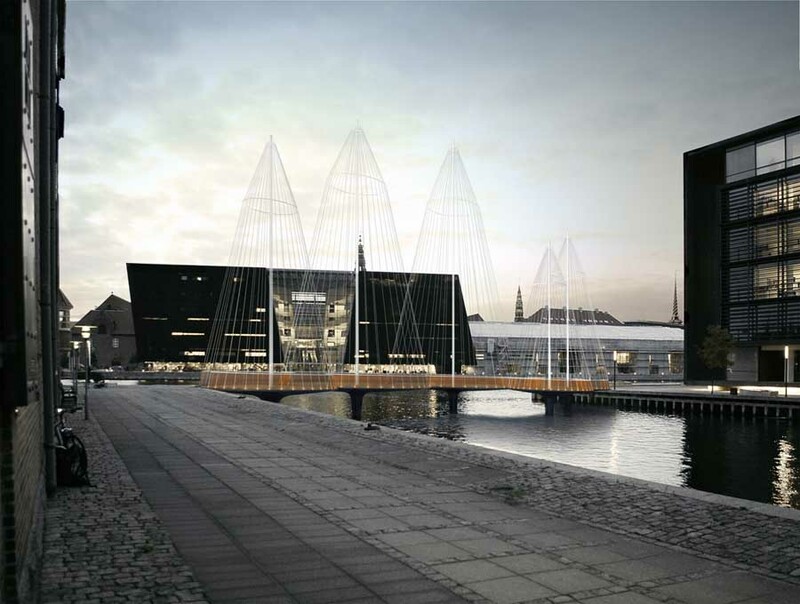 The Nordea-foundation is the developer and builds the bridge as a gift to the Municipality of Copenhagen. 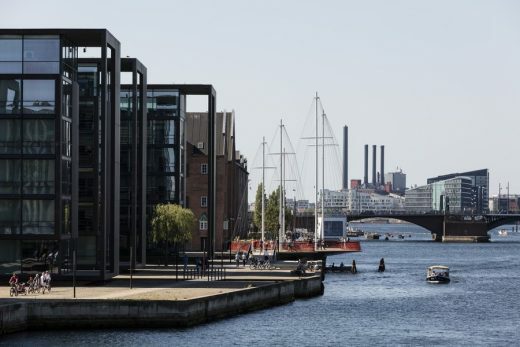 As stated in the budget agreement for 2010, the parties of the City Council have agreed to ensure the residents of Copenhagen better access to the areas along the port by promoting a bridge across Christianshavns Kanal from Appleby Plads to Christiansbro. The parties have agreed to procure the required planning along the canal. The bridge is expected to be completed in 2012.